Engrave Area (W x H): 2" x 1"
It's shucking time! Here's a great addition to your specialty knife collection. 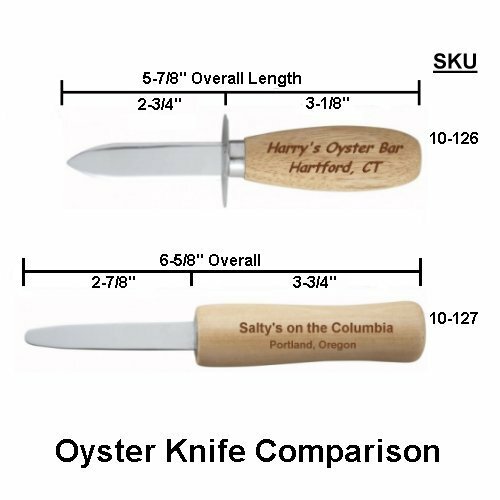 These oyster bar grade oyster/clam knives are 5-7/8" overall length with a pointed 2-3/4" blade with a steel haft to protect your fingers from shell splinters. 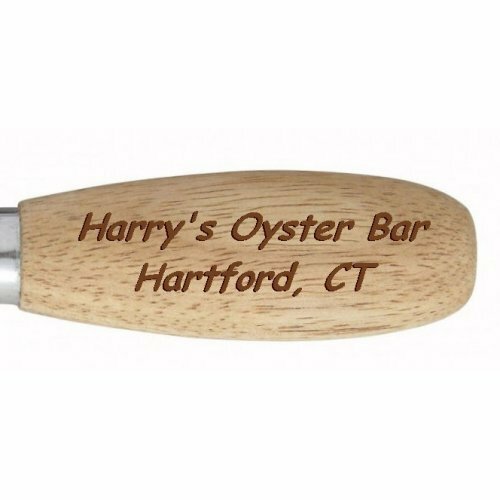 The beautiful natural wood handles engrave beautifully so make them your own by engraving your name or initials on each knife handle and transform them from great knives into a truly memorable gift. The laser cuts clean and deep into the wood in your choice of six different fonts. The cut is deep, very sharp and high resolution and, unlike ink based marking, the laser engraving will never fade or blur over time. Great for that family special occasion, clam bake, for corporate gift giving or for other promotional product use. 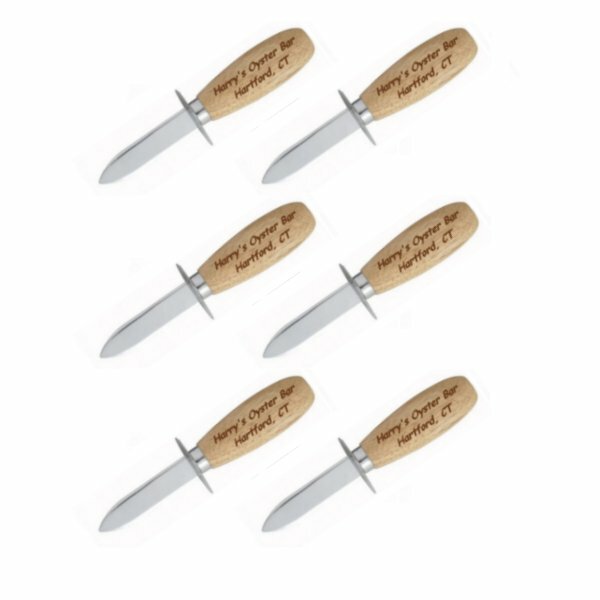 Matching set of six personalized oyster/clam knives. 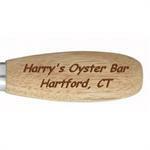 The standard* imprint area on the handle is 2" x 1" on one or both sides of the oyster/clam knife handle. You just select the font of your choice from a drop down menu in the shopping cart then type in your text into the text box. Solid Construction - these restaurant grade oyster/clam knifes have a brilliantly polished stainless steel blade. They also have a steel haft to protect your fingers from shell fragments. The knives are nicely balanced with substantial heft to them. They are a generous 5-7/8" long overall. The pointed 2-3/4" blade has a ground cutting edge. Flexible message location - we can engrave your text message on the inside or the outside of the knife handle. Engraving always starts so the text reads from left to right with the knife held in your right hand. If you want the same message engraved on both sides of the knife handle there is a $3 additional charge. If you want a different message engraved on the inside and outside of the knife handle there is a $5 additional charge. 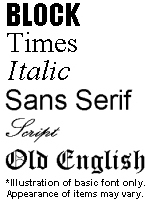 Flexible message - Just select your font from the six fonts we know engrave well (select using a drop down menu in the shopping cart), select inside or outside handle engraving then type your message text in the shopping cart text box and we'll do the rest. Add more knives to your set - need an extra knife or two to complete your place settings for that big clam bake? No problem. Just add up to five extra knives and we'll automatically adjust the price of your set. Quantity Discounts - order multiple knife sets with the same engraving and your cost goes down. Great for holiday or special occasion gift giving and they make great corporate promotional gifts. Delivery to meet your schedule - Standard production for orders of up to 25 sets is normally 7 working days from receipt of your order except for the holiday season from November 15 through December 31 when standard production goes up to 10 working days to accommodate our surge of holiday orders. NOTE: For orders larger than 25 pieces please give us a call. Production times represent production time from our receipt of order to shipment; they DO NOT include shipping time in transit. 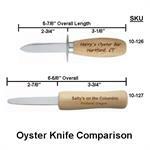 Make your oyster/clam knife set into more than just a high quality gift. Our laser engraving makes it easy for you to customize the knives for any occasion. IMPORTANT NOTE: like most natural wood products, these wood handled oyster/clam knives are not dishwasher safe; exposure to hot water can cause the wood to warp or splinter. 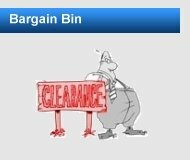 These items should be gently hand washed and dried thoroughly. For optimal results, periodically rub the wood handle with oil to prolong the life of the wood. *PLEASE NOTE: The standard engraving options shown here are but a small fraction of the engraving we can perform with our state of the art laser engraving system. Logos, names, messages, etc. can all be engraved. If you want fully custom engraving, whether 10 or 1,000 or more for your next promotional product giveaway, contact us for details.